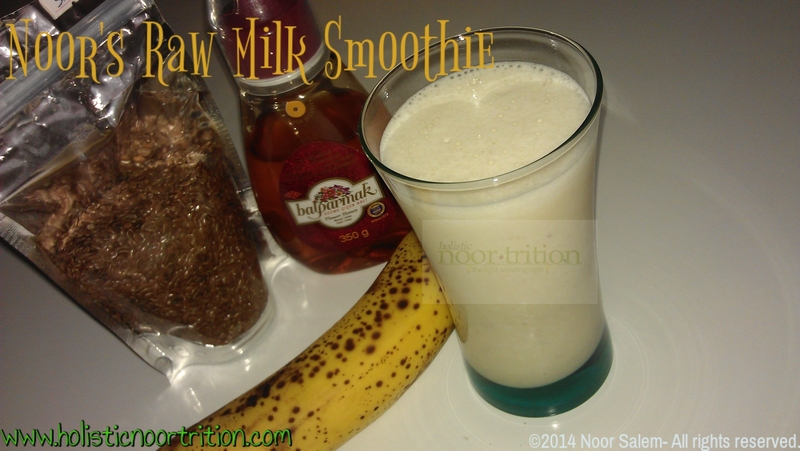 Did you ever try raw milk? Well if not, let me explain. Raw milk is unheated, unpasteurized, unprocessed milk. It contains live probiotics, and since it’s not pasteurized the enzymes that help you digest lactose are not killed- it’s easy to digest even for those that are lactose intolerant! I don’t drink conventional milk, so it was a definite treat to drink this raw milk, especially knowing the numerous benefits it has. 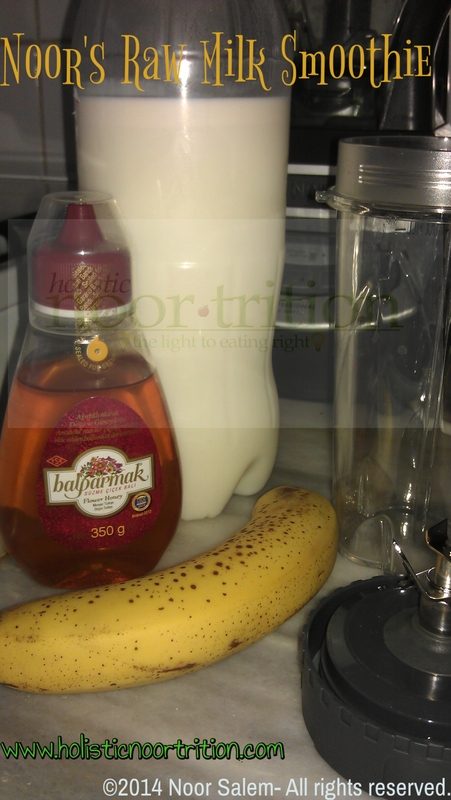 So while I was in Turkey this past summer visiting my sister, I put together this raw milk potassium smoothie. The raw milk provides live enzymes and plenty of probiotics. Tossing in the banana doesn’t only provide potassium, but also fiber to aid in digestion. Bananas are high in Vitamin B6, manganese, and surprising to some, has Vitamin C. I must mention I try to always use bananas that a ripen, with brown spots on it .Believe it or not but it will have more benefits for you. Plenty of digestive, cardiovascular, and athletic performance benefits come from bananas too. Need to say more? I didn’t think so. The flaxseeds provide healthy fats, Vitamin B1, and omega-3 fatty acids, which we need from food sources. Flaxseeds are wonderful anti-inflammatory super-seeds. The honey is more than just a natural sweetener; it has numerous benefits including antimicrobial and antioxidant benefits, along with the wonderful phytonutrients. We only buy unheated and unpasteurized raw honey. Check these raw honey options out. So, what’s not good about this smoothie? It tastes amazing, makes a perfect dessert, and has mind-blowing benefits. 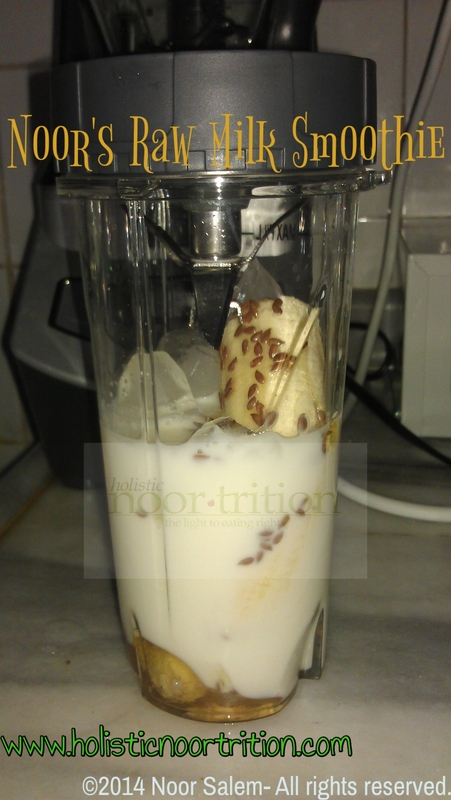 Place milk, banana, flaxseeds and honey in a single serve blender. Blend until smooth. 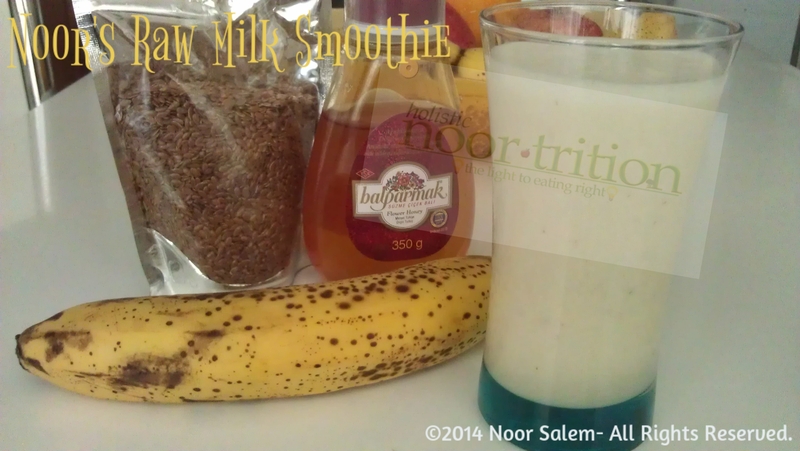 Raw milk, ripe banana, Turkish local honey, and flax. Place in single serve blender. Drink immediately for maximum benefits. Drink immediately to receive maximum benefits. Move over Tylenol, here comes Holistic Noor and her smoothie. This smoothie contains pain relief benefits, without the negative side-effects. 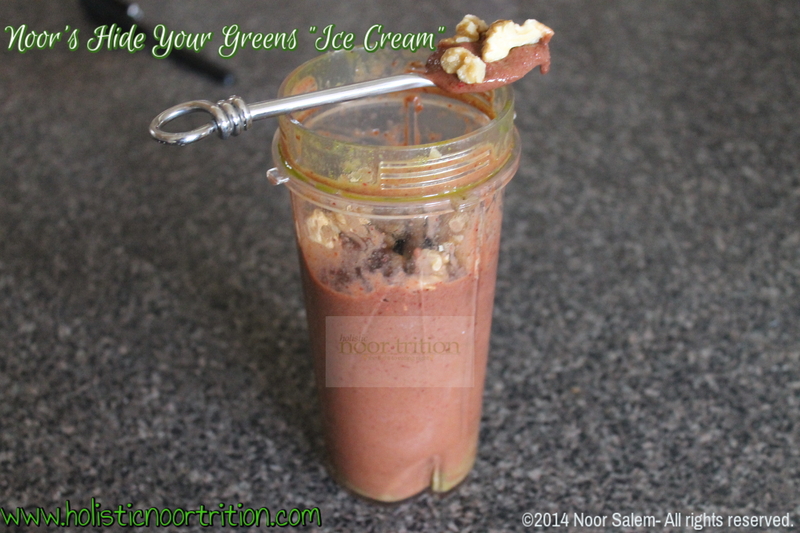 Did you ever imagine kale or spinach in your dessert? Well, I’m here to make it happen without making you plug your nose drinking it. When you’re craving that sweet treat or need some energy early in the morning, this recipe is the perfect drink. You can put less liquid and call it ice cream, or you can add a bit of liquid to make it a drinkable smoothie. That’s up to you my friend. As for this smoothie, it’s full of super-foods, and therefore is high in Vitamin K, Vitamin C, potassium, dietary fiber, antioxidants, omega-3 fatty acids, anti-inflammatory benefits, flavonoids, muscle recovering anthocyanins, and more. What am I talking about? Well, one of the secrets here is the Organic Tart Cherry Concentrate, considered a super-food. It’s full anti-cancer mechanisms, has anti-inflammatory benefits, cardiovascular benefits, joint pain relief, and the potent flavonoid, anthocyanins, which are known to not only reduce stress and inflammation, but also do a lot with aiding your muscles in repairing. So this smoothie/treat would be perfect after a workout. Get on it. The banana is not only there to cover up the vegetables, it also aids in muscle recovery, aids in constipation, lightens your mood, and actually stimulates growth of bacteria (the good kind!) in your gut. The flaxseed? Where do I begin? If I were to recommend one new habit everyday it would be to add flaxseed to your routine. 1-2 tablespoons a day is great. They are high in insoluble and soluble fiber, omega-3 fatty acids, and have anti-inflammatory benefits. Make sure to buy whole flaxseeds (unless your pre-ground is cold-milled) so you don’t eat them without the benefits. Grind them in a spice grinder and top them on your smoothies, avocadoes, soups, or salads. Hey, where’d my greens go? 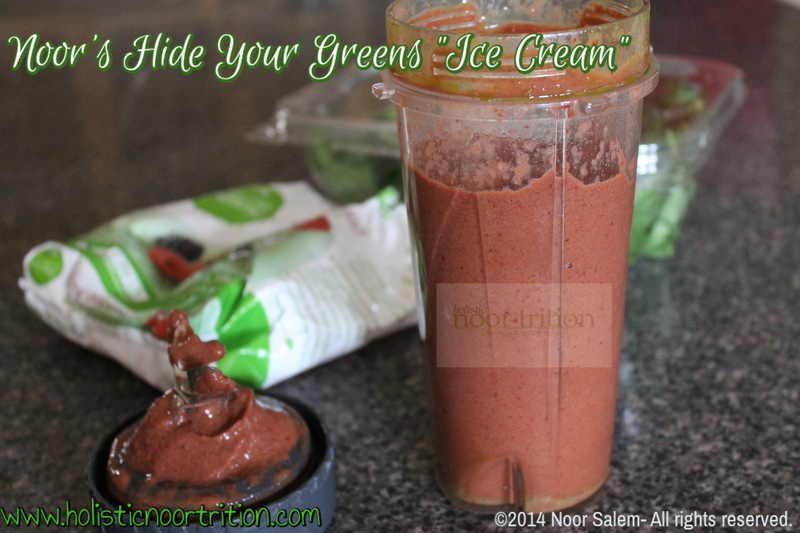 In your single serve blender, blend the liquid, organic tart cherry concentrate, and the organic fresh greens until it becomes a pure green liquid. Add the banana, berries, and flaxseed. Blend will. Top with the walnuts if desired. Drink or spoon up immediately! Feel the energy? I’m sure you do. I was driving home from my personal training session (gaining weight :)) at the gym after realizing I forgot my protein shake at home and was heading to University afterwards. I recalled a friend mentioning drinking a protein smoothie at Starbucks, and kept debating in my head whether to grab one or not. I passed by Starbucks and decided I’d give it a shot. They had two flavors, strawberry and orange mango. I’m a fan of anything that has to do with mango, and decided I’d give it a shot. 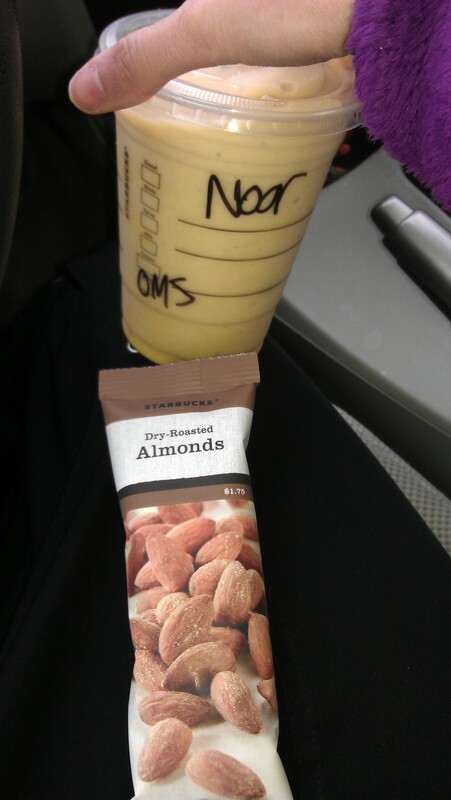 I grabbed my usual dry roasted almonds for an extra protein punch. She handed over my drink as she finished writing my name on it. “What’s inside the cup is not so personalized“, I thought. I took a sip of the drink and found it to be very, very sweet. Is this really a protein drink? Yikes. I knew they didn’t stick in real fresh mangoes, except the half banana she peeled and tossed in at the end. It tasted like sugary melted ice cream to me. I ended up sticking with the almonds and thought I’ll rather lack my protein shake than drink this stuff. 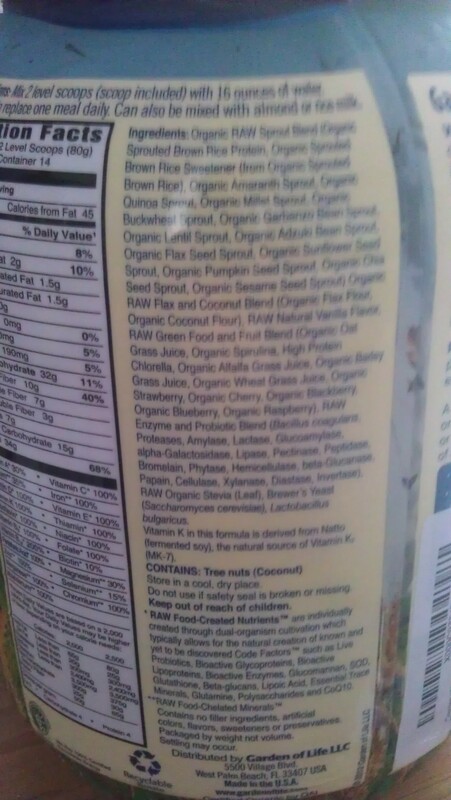 I was very thankful later that day after doing research and learning that this protein smoothie was nothing but a chemical based powder they use, with milk, half a banana and deception. 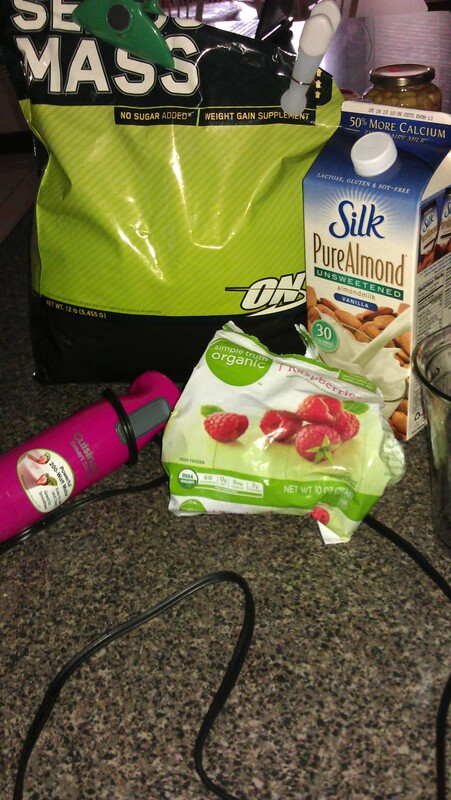 So I usually have regular protein powder with organic grass-fed milk or unsweetened almond milk. At times I spice things up and make a specialty. Here I had organic frozen raspberries, RAW protein powder, a dash of chia seeds, flax seeds, and yes, raw walnuts for omega-3 , fiber, and protein boost. 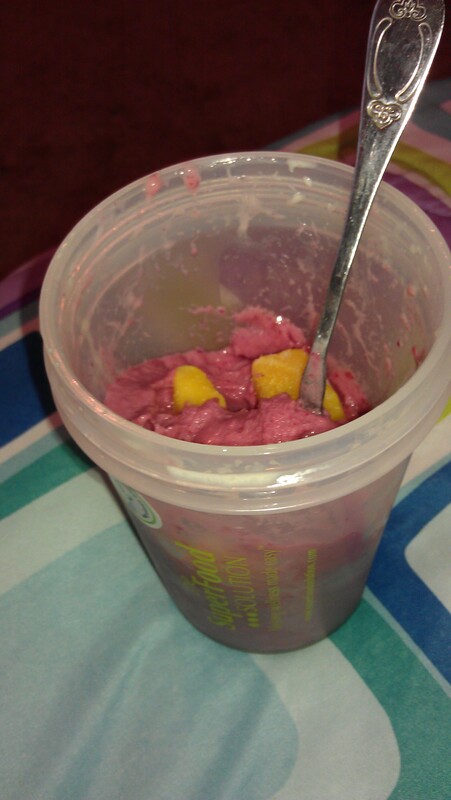 Of course, I had to add frozen organic mango chunks. I love mangoes! 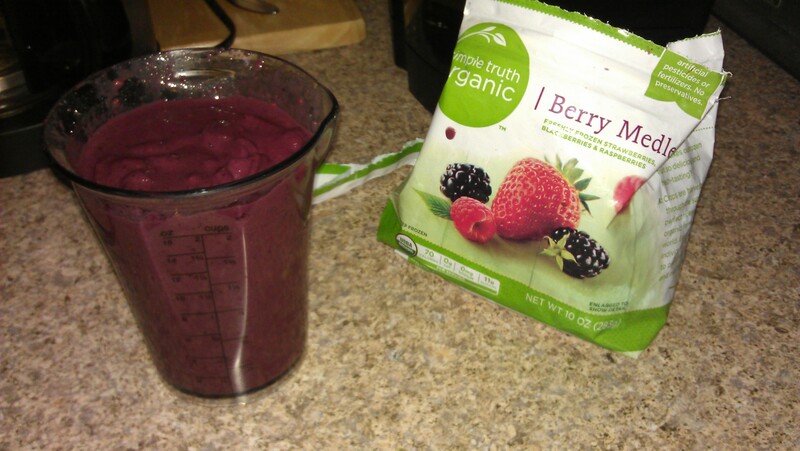 Here I had frozen organic berries, flaxseeds, and milk along with the RAW protein powder. 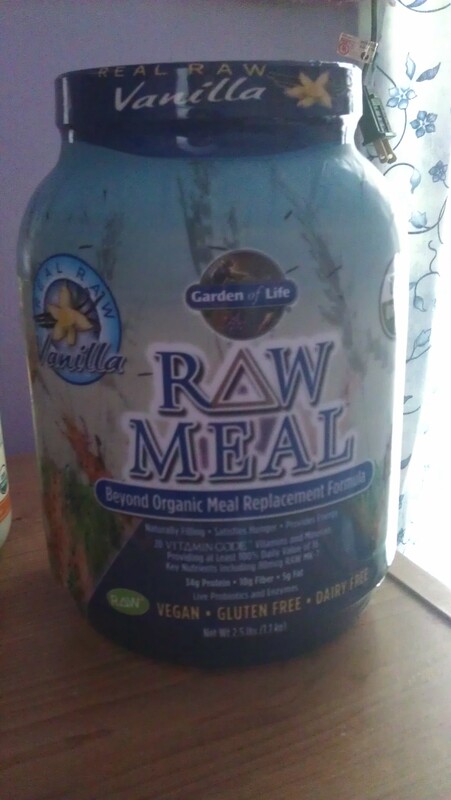 What’s up with my RAW Meal protein powder you may ask? Well, let’s begin with saying not everyone will like the taste. One friend told me it smells like cattle food grass and wouldn’t bother tasting it. More for me. Well, check out the label and you’ll see exactly why. =) My friend calls this “cattle food” because of it’s grassy color, smell, etc. Yeah, it’s organic! Place all your ingredients in the hand blender cup (or a blender if you don’t have a hand blender and cup) and blend until smooth and well mixed. Enjoy! I like mine thick and try putting less milk* so it’s not too watery. It tastes better than ice cream!! 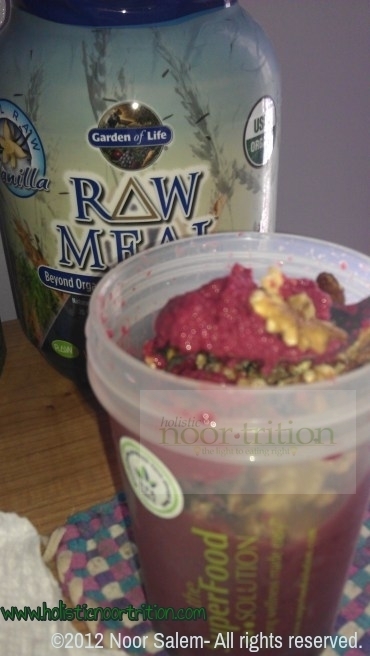 Raw meal w/ organic berries blend, mango chunks, and raw walnuts…My specialty. Yeah I was using super mass to gain weight. I bought the RAW as an alternative though. Okay so the past few months I’ve had a daily dose or two of some Starbucks tea. While my friend would order a green tea with raspberry syrup and lemonade, I opted for an unsweetened iced green tea. Eventually I started ordering it with no “H2O” to make it stronger. Just today my friend decided to try making her raspberry tea at home and purchased an entire bottle of the Starbucks raspberry syrup from Starbucks. Lol. I read the ingredients and freaked out. I knew it was bad, that’s why I didn’t get it in my order prior. But now I was confirming how bad it was. First ingredient read: sugar- and it got worse. Red dye, potassium sorbate, and more long multisyllabic words I only recognized as chemicals. It sounded more like a bathroom cleaner product than “food”. It’s not only Starbucks with such, but whenever you purchase drinks from restaurants you need to be wary. Anyway….the competition went on. We used my usual organic green tea from home, and made an entire jug. After it cooled down she added lemonade and raspberry syrup, creating the ultimate same old drink. I took on a different role. I squeezed fresh lime and lemon and added it to my tea. Then an idea hit me. I opened the freezer and grabbed bag of my frozen organic raspberries. I smashed them in a sandwich bag and threw them in my tea. I “shake the bottle” well since at Starbucks they are known as “Shaken ice tea” since they literally shake them well. Point is, I loved my tea and was impressed. I couldn’t tell a difference in the color between the two. Other than the pieces in the bottom of my cup, which I enjoyed coming up the straw, they were twins. Brew the tea and add it with the water, lemon juice, water, and raspberries. Shake well. Add the ice. Enjoy. *If you dislike little raspberry bites floating in your cup you could sift it. Unsweetened Organic Green Tea, fresh lemon and lime, and organic raspberries. Read your ingredients my friend!